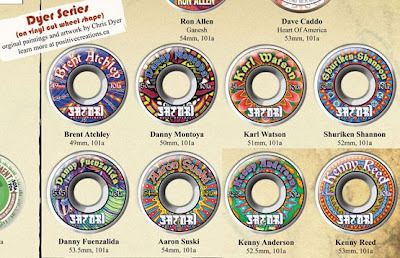 Satori Movement is the dopest Skateboard wheel company coming out of San Francisco, California. I have been working for them for 5 years (Mostly doing t-shirt art) but now Ive finally gotten my first Wheels series. I am super stoked cause now I have crazy awesome Pro skaters like Watson, Anderson, Reed, Montoya, etc. rolling on my art. To buy some go to www.cultureskate.com .